It is still hard to believe the years that have gone by.. It could have been yesterday that I was back from Bangalore and my heart giving me weird signals about a guy, who was a little more than friendly. The one who bought me flowers, despite the fact that we were in two different cities and we really did not even have a relationship..
Just an ease, of being with each other despite the distance. The hunger, to just tell the other person, about how the day was. A sense of emptiness and a pang in case of the day went by, without talking to each other. And just the weird habit of smsing each other total 'mush' songs! That was when we were just friends. And finally, on the most cliched day of the year, seven years back, he decided that he had had enough of counselling me about the a guy who doesn't care, and I decided that I have had enough, of the flirting around. And we got ourselves in to a relationship- A 'boyfriend- girlfriend' relationship with each other, where at the most we had seen each other once over the web cam, maybe for a few minutes. Seven years of facing the down more than the ups.. of fighting over EVERYTHING under the sun, but still fiercely protecting our love from the world. Yes, we have faltered, YES we have had the 'I Quit' emotions. But we have still held on. Yes, I still live my fairy tale romance, and I still believe that Love conquers it all. Call me an optimist or call me and Idiot, but yup- I love the idea of being in love. And this year is very special, because, together we discovered the comfort of being in a relationship, of knowing that we are there, without the words. And as I come to terms with the fact that this is our 7th Love Anniversary, I just pray that the itch doesn't really trouble us, and that this year, we discover more to our relationship and more to our Love..
Love is all I have to give"
Valentine's is also about spreading the love.. so I wish you all, all the love in the world and hope that love makes your world a very Happy Place! good to hear that you beleive in all the love and romance , Not many people can boast of that.. lucky are the ones who live that life .. Happy valentines day to you tooo ..
May you both spend Many Many Valentine's Days in each other's company with all the love and happiness. True love conquers all. Seriously you have such a thrilling story which is not just magical but a wonderful memory. It feels nice to hear love stories like yours and I wish you both a happy and magical life all along. Happy Valentines Day! You seriously are suggesting to scratch the itch? You gave a major way out to Shayon! This is such a sweet , sweet post! 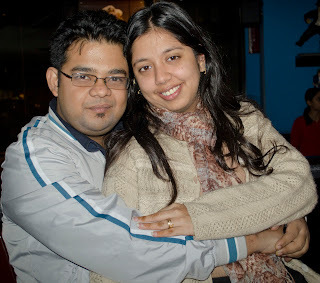 Happy anniversary..Came across your blog while blog-hopping and it's been wonderful reading your blog posts:)Good to know seven year itch is just a myth !